Food for thought, as we celebrate Independence Day and all of the nostalgia and heritage it invokes, South Orange County is considered by surf historians to be the birthplace of the surf industry. Grubby Clark, Hobie Alter, Dale Velzy, Bruce Brown, the list of luminaries from the 1950s and 1960s runs long. Reason enough to celebrate, but those gents wouldn’t be the legends that they are without their Hawaiian forefathers, who conceivably “invented” surfing. But maybe they didn’t. Maybe surfing is more South American than Polynesian? Last year, I had the opportunity to edit a new book on the history of surfing. Not your typical yarn about the islands, the Duke and all the Polynesian flattery, the book, titled 5,000 Years of Waves: A History of Surfing in Peru, details the 5,000-year history of wave riding dating to pre-Inca cultures. 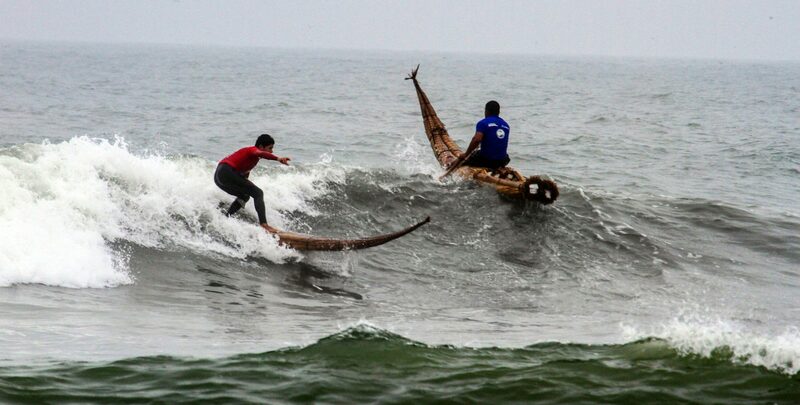 The contention is that surfing in Peru predates surfing in Polynesia by hundreds, if not thousands of years. Based on archeological records, Peruvian fishermen began riding reed crafts called “tups” or “caballito de totora” around 800-600 B.C. Some of the earliest records of “he`e nalu,” or wave sliding, in Hawaii is traced back to the 15th century A.D.
Meza details how two ancient Peruvian cultures, the Mochica and Chimu, could be where surfing actually began. Iconography in archeological remains found in the Huaca Cao Viejo in the El Brujo complex show endless sequences of waves. Archeologists believe the waves represented the movement, strength and power of the sea as a source of life. The economic and social development of the Mochica and Chimu cultures was linked to fishing: they turned the Pacific Ocean into one of the largest fisheries in the world. They devised their own styles of art, social organization and construction of large cities and pyramidal complexes. During that time, fish was the main source of protein in the diet of an estimated one hundred thousand inhabitants of the city of Chan Chan. Over time, Peruvian sailors found their way to the islands of Rapa Nui (also known as Easter Island). From there the early settlers of Rapa Nui were able to make forays into Polynesia and, allegedly, spread the concept of riding waves.